Résidence Pierre & Vacances Atria-Crozats is located 12 km from Morzine Ski Resort, in the Haute-Savoie region, 75 km from Geneva Airport. It offers fully equipped self-catering apartments and an on-site well-being centre. Each apartment is equipped with a kitchenette with fridge, microwave and dishwasher. Apartments have a seating area and a dining area. High-speed internet access is available in the apartments. Guests can enjoy a drink in the bar and restaurant. There is also a sauna, hammam and cardio-training equipment. Guests staying for more than 1 week will receive a free leisure pass, giving access to several activities. Upon prior reservation and depending on the date of the stay, guests can benefit from reduced rates for ski passes and equipment rental. There is a shopping delivery service available at an additional cost, in winter months, and bread and pastries delivery service is available at the reception. The aparthotel is located 7.3 km from Les Gêts and 24 km from Samoens. Marignier Train Station is 30 km away. L'Aquariaz Mountain Spa is located nearby and offers over 2000 m² of swimming pools and slides. There is also a climbing wall, outdoor hot tub with valley views. Board games can also be borrowed for free. This ski hotel is situated in Avoriaz resort, just 14 km from Morzine. It is less than 300 metres from the ski tracks. There are plenty of bars and restaurants nearby as well as a bakery and a minimarket. The hotel offers self-catering studios and apartments with satellite TV and individual balconies providing magnificent mountain views. This is a family-friendly residence offering entertainment activities for children and adults. For a truly restful vacation, guests can visit the L'Aquariaz Mountain Spa which is located nearby and offers over 2000 sqm of swimming pools and slides. There is also a climbing wall, outdoor hot tub with valley views and a slow flowing river with picturesque banks. When you stay at Hôtel des Dromonts in Morzine, you'll be in the entertainment district, just steps from Avoriaz Ski Resort and 6 minutes by foot from Aquariaz Water Park. 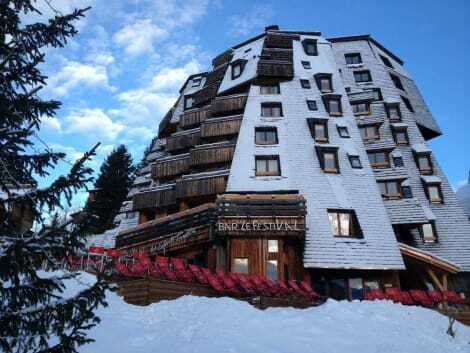 This 4-star hotel is 3.4 mi (5.4 km) from Portes du Soleil and 8.8 mi (14.2 km) from Les Gets Ski Resort. With a stay at this residence in Morzine, you'll be a 1-minute walk from Avoriaz Ski Resort and 6 minutes by foot from Aquariaz Water Park. This residence is 8.2 mi (13.2 km) from Les Gets Ski Resort and 27.1 mi (43.6 km) from Samoens Ski Resort. Enjoy the convenience of ski-in/ski-out access at this residence, which also features a fitness center. In the heart of the Portes du Soleil in the Alps, near the Swiss border, Avoriaz is one of France's major ski resorts and one of the world's top snowboarding destinations. Its scenery is stunning, with mountains, forests, pastures, valleys and lakes to admire along its varied ski routes. The mountains in Avoriaz have guaranteed snow cover from December to April, with an average of eight metres of snow falling each winter. The resort is also popular in summer, particularly for mountain biking – there are 650km of trails, including one 80km route, and three mountain biking schools. Hiking, golf and other outdoor activities are also on offer. If you love the outdoors, then any time of year is a good time to book one of our Avoriaz hotels. Cars are not allowed in the resort, which was purpose-built in the 1960s. You get around on foot, on skis or in sleighs. Winter activities include skating, dog sledging, horse-drawn sleigh rides, Nordic walking, Segway riding, snowshoe walking, snow karting and night-time sledging. You can also ride on a snowmobile, or even go skiing while being pulled along by a horse. Summer activities include skydiving, crazy golf, trampolining, bowls, squash, basketball, caving, beach volleyball, tennis, archery, hiking and SEOSITE_LEVEL_DESCRIPTION tennis. There are also giant outdoor games, including checkers, chess and tic-tac-toe, as well as a climbing wall and a golf course. If you want to relax away from the slopes, the resort has three spas, as well as fitness classes and swimming for those who want to stay in shape. There are several restaurants and bars – including an igloo with an ice bar and restaurant – a bowling alley and a cinema, and several shops selling mainly gifts and sports equipment. Avoriaz hosts regular festivals and events, including music and dance festivals, a festival celebrating traditional mountain life, European Gay Ski Week and a snow carnival. You can also join trips, from hikes where you'll discover the Alpine plants and look out for marmots and ibex, to visits to a cheese works or to lakes and glaciers. On the farm, you can see cows being milked and buy cheese, sausages, ham and jam. Avoriaz is popular with families as there's so much for kids to do. As well as all the above, there's a children's village for three to 13-year-olds, with activities from music and circus classes to horse riding, judo, fencing and building a log cabin. The Aquariaz water park has water slides, water guns, fountains, a lazy river, a large padding pool and an outdoor Jacuzzi. And, of course, there are skiing and snowboarding classes specially for children, as well as kids' events.